Pheromones are supposed to be the stuff that make animals do it like they do on the discovery channel. They are supposed make mothers love their babies and babies imprint on their mothers. But there are also kairomones — which just get animals killed. Pheromones are supposed to move between animals of the same species carrying vital communications like, "I'm fertile and in the mood," or, "Don't eat me. I'm your child." Whether they work on humans is a matter of debate among scientists. It might be better if they didn't. As pleasant as it sounds to have a chemical connection with your partner, pheromones aren't all good. Semiochemicals, chemical communication signals, aren't just picked up by members of an animal's own species. Other species can detect them as well. Sometimes this interspecies communication is beneficial for both animals. Chemicals that work out for both species are synomones. Sometimes the producer of the chemicals benefits while the animal that picks up on them loses out. Those are allomones. And then there are kairomones. These are chemicals that provide great benefits for the animals picking up on the communication chemicals by hurting the animals that secrete them. In prey animals, kairomones guide the predator to the prey. 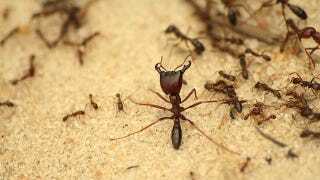 Army ants put down a pheromone trail that leads the blind snake and a forest beetle right to their nest, where the predators will feast on their young. It's easy to see how this happened. The pheromones allow the ants to follow each other around the forest floor, and, over time, certain predators evolved to associate the smell of ants with a trail that leads to food. The benefit of being able to communicate with their fellows across large stretches of forests outweighed the occasional snake-induced nursery massacre, so the army ants still put out scent that attracts their predator. Less understandable is the ponderosa pine. When it gets attacked by the red turpentine beetle, it puts out a scent. The scent doesn't do much else except attract more red turpentine beetles. Some kairomones help animals zero in not just on prey but on the most desirable prey. Sick hedgehogs put out a kind of chemical signal in their feces that fleas find irresistible. As soon as a hedgehog gets sick and weak, the parasites come running. This kind of signal isn't confined to the hedgehog. Agricultural scientists are keenly interested in pinning down just how sickened animals attract parasites that keep them spiraling downwards in health. Fleas, ticks, and other parasites follow kairomones to livestock and poultry too sick to pick or scratch them off. When humans step in, this predator-prey relationship gets a final twist. Scientists discovered that bark beetles were inadvertently putting out kairomones when they set out traps for bark beetles baited with bark beetle pheromone, only to catch nothing but the beetle's predators. So the beetle put out a chemical that increased its chances of death, and its predators followed the pheromone to their own death at the hands of a new and better-equipped predator. Prey animals aren't the only ones burdened with kairomones. Predators also put out signals that screw with their own chances of survival. Mice that have been removed from cats for generations will still run away from the proteins in cat urine. There are at least 38 species of small mammal that will run when they smell bobcat urine. Whenever a feline pees, it's driving away its own food. And kairomones don't just confound large, fierce mammals. Some scientists think that certain fish give out pheromones that scare off phytoplankton. (Although the effects of these kairomones have to be limited. How fast can phytoplankton get away?) The fish, in turn, may be scared away by kairomones given off by otters. One experiment noted that even naive salmon, which hadn't encountered otters before, went on the run when they scented otter in the water. A second study cast doubt on the results of the first. It seems that the otters in the first study had been fed salmon before they were put in the water. When scenting an otter that hadn't been eating its fellows, the salmon didn't flee as quickly. So either kairomones are running off an otter's prey or its own eating habits are. Not all kairomones make prey run. Some make them arm themselves. A group of small plankton, when they are in the presence of water fleas, grow odd little helmets that cover their heads. The encumbrance slows them down when they swim, but the large, hard growths keeps the flea from eating them. As soon as the fleas leave the water, the kairomones they put out abate and their dinner takes off its armor again — regaining its maneuverability.